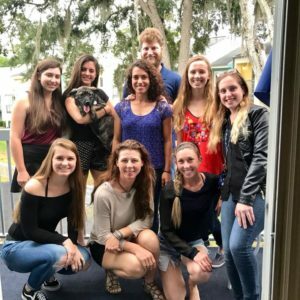 Two years ago, a few members of The University of Florida Equestrian Club decided to start an Eventing Team within the club. They asked me to be their coach. I jumped at the opportunity. I grew up in New Jersey, and I have a BA from Rutgers University in English and theater. I chose Rutgers over other liberal arts universities because it was close to home for me, and that meant that geographically and financially I was able to continue to ride and train while I attended college. I am in the minority as a CCI4* rider in the U.S. that also has a college degree, and I am eternally grateful for the education and life experiences that I gained while at Rutgers. As a coach for the UF Eventing Team, I have been able to support both my sport and younger riders pursuing a liberal arts education. I have been incredibly impressed over the past two years with the poise and dedication that the kids on the team have exhibited. They show up neat, clean, professional and ready to learn. They come on their lighter days and work in the barn, and many have done internships in the barn for college credit. The team started off with twelve active members in the first year, and then expanded to about sixteen in the second year. 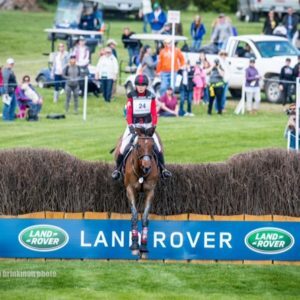 Roughly half of the team own their own horses and had already competed in the sport of eventing when they joined. The other half were riders with a decent foundation of skills coming largely from the hunter world who were ready to try something outside of the ring. Although a few of the the higher level team members compete through the upper levels, the bulk of the riders are riding at beginner novice or novice, or even just starting to get into the sport at tadpole. 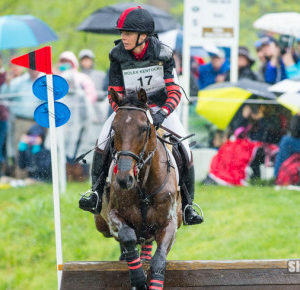 Three day eventing is an incredibly involved sport. It is a triathlon. You have to be proficient in three different styles of riding – dressage, cross country, and show jumping. Not only that, when you compete you have to know the rules for all three phases, and bring things all together over a one or two day period. This winter the Ocala Horse Trials hosted it’s second Intercollegiate Challenge, and we were able to field two teams. 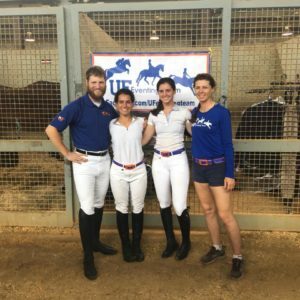 In May, we also sent the first UF team to the Intercollegiate Championships in Virginia. In both cases, I was reminded of the many, many bumps that I myself hit along the way as I improved as a rider. 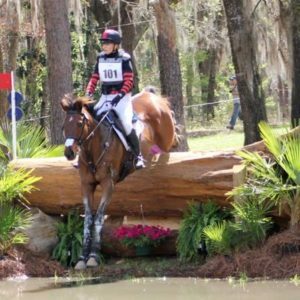 At the Ocala Horse Trials, many of the riders did well and were in the ribbons. Some, however, had disappointing weekends. One rider was on a younger horse who was very spooked in show jumping and was eliminated after three refusals. Another rider’s horse was far more excited than she had anticipated and she wasn’t able to manage his speed. She, too, was eliminated in a jumping phase. 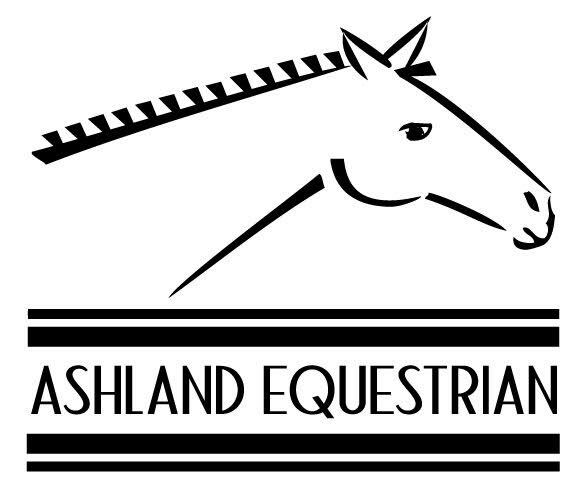 At the Intercollegiate Challenge in May, two of the riders achieved personal best dressage scores, but of the three team members competing, only one was consistent enough across the weekend to finish on his dressage score and in the ribbons. Last week, I took a group of the kids cross country schooling at a new venue, and one of the girls lost her confidence when her horse started trying to duck out. She knew that she would have been fine over an identical jump at home, but this new experience was nerve wracking for her. Sport can have a profound impact on us as people. It gives us a physical outlet. It helps us create goals to work towards. It creates camaraderie that reaches across boundaries. 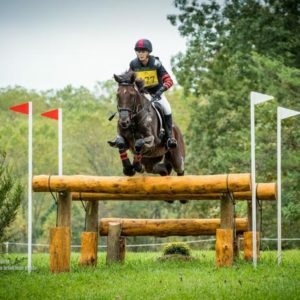 This spring, while I was competing at the Land Rover Kentucky CCI4*, I was walking my cross country course on Friday at the same time as one of the most prolific riders of my time, the German rider Michael Jung. Jung, who had flown his horse over from Europe, was sitting in second place after dressage, and was there to win. I was there to jump around clean for a second time, and gain more mileage for my next 4*. Jung and I approached jump five together, measuring our minute markers on a meter wheel. As we walked, he turned to me and asked me how my dressage test had gone. One of my friends remarked that this is something like Brad Pitt asking you how your acting career is going. I smiled and replied that I had been pleased with my horse, and I asked him how his dressage had gone. He said that he was happy with his ride as well. In that moment, we became friends within the sport. Sport has an incredible ability to break down boundaries and create community and leadership. As my UF kids work along to become better riders and better competitors, they support each other through the highs and lows. Sometimes, the first time something goes wrong at a show or in schooling, a rider might be very surprised. Sometimes there are tears. Inevitably, though, the other team members rally around them and tell them of their own war stories, encouraging them and helping them to see the bigger picture. It reminds me of how, so often, we don’t actually play sport in order to win. We play sport in order to play. In 1973, as the director of the American Civil Liberties Union’s Women’s Rights Project, Ruth Bader Ginsburg won the first gender equality case that she argued in front of the Supreme Court. Her historic career, which has spanned six decades and an appointment to the United States Supreme Court in 1993, is outlined in the new documentary RBG. Ginsberg attended Harvard Law School in the 1950’s in the first year that Harvard admitted women into the program. That year, women comprised less than 1% of her class. When Ginsberg was asked later in her life when she knew that she wanted to become a judge, she merely answered that she knew she had a talent for the law, and that she felt that pursuing a career in law could promote concrete changes in policy in the area of gender equality. From the beginning, her strategy was not to open a floodgate, but to produce a step by step foundation of carefully chosen legal precedence on which future cases could stand. Ginsberg has chosen, repeatedly in her career, to act in the moment. Last month, as a professional female athlete in one of only a few mixed gender Olympic level sports, Tactical Maneuver (Gucci) and I completed our second CCI4* at the Land Rover Kentucky CCI4* in Lexington. The weekend was gorgeous. We had rain early in the week, but then the sun came out and the springtime Kentucky grass drank up the water to provide some of the nicest footing we ever get to run on. This time at Kentucky the weekend had a different feel than our debut at the level in 2016. Gucci has matured, and our partnership has solidified even more after seven cumulative years together. We both knew what we needed to do. I am academic about the way that I learn and improve. I need to own an idea before I can implement it. My goals for the weekend were to have a quiet dressage test, jump clean on cross country, and try to stay in the flow in show jumping even though I knew Gucci would want to become electric. Given how emotional Gucci can sometimes be in the dressage and show jumping, I felt satisfied with what we produced. It was the cross country, however, that was the interesting part of the weekend. I had planned to take one or two long routes and several direct routes. As we went out early on the eleven minute course, Gucci was not the focused cross country tiger that he usually is. He slightly hung going over the vertical on the mound before the water at jump four. Then, two jumps later, he really scrambled over a similar vertical jumping into the coffin. I had to dig in. 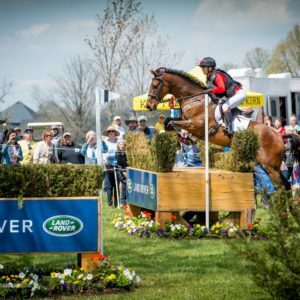 When I was living up north and first competing at the FEI levels, I would regularly get help from Olympian and eventing legend Jimmy Wofford. Jimmy’s academic approach made sense to my developing brain. Jimmy used to say that each jump was like an item on a list with a box next to it. When jumping cross country you had to make sure you checked off each box. At Kentucky a few weeks ago, I went back to that advice, and after a few sticky jumps early on, I decided that I needed to work my way around with Gucci and take more long routes. I had to say to myself, “this is what is happening now” and I had to ride in the moment. In the end Gucci’s innate cross country ability shone through and we jumped around clean. A few weeks before Kentucky, I was helping one of my kids at a horse trials in Ocala, FL. She is a teenager and I have taught her for about five years. She was nervous before going out on cross country. She asked me if I ever got nervous and if so, what I thought about before I left the start box. I was surprised that we had never talked about this before. I told her that I used to get very nervous. Then I said that what we learn as we become better riders, is that producing a good result is not a floodgate, but a progression of steps, laid in a foundation, upon which we can rely. I trusted my horse, I trusted our education and our partnership, and I knew that I was going to ride the best that I knew how to every jump. When I figured this out as a rider I then became able, each time I walked to the start box at a big competition, to watch Gucci’s ears flopping side to side, to put a hand on his neck and pet him, and to enjoy the moment. I watched RBG with my mom as a Mother’s Day activity. The documentary itself was excellent, but it was also moving to sit through the film knowing that my intelligent, outspoken, action-oriented, independent mother lived through this same period as a young woman. I realized that the quality of my own life is greatly influenced not only by my mom’s experiences and views, but also by Ginsberg’s work. I have always thought of myself as the daughter of a feminist, but in fact I am the daughter of many feminists. In my own competing and in my work as a trainer, I hope I am able to pass these qualities on to those whose lives I touch. British actress Helen Mirren has had a film, television, and stage career that has spanned over fifty years. In her current masterclass, Mirren states that you must never act in front of a mirror. Acting, she explains, is never about the expression on your face, but instead it is defined by your internal process. The internal process is the one that produces masterpieces. In sport, and in life, it is so easy to feel the need to act in front of a mirror — to look around and gauge yourself by your reflection or your ranking, and to wonder where you fit in. Earlier today I received a call from an event rider whom I met two summers ago while I was teaching in Minnesota. She is in Ocala for the first time this winter working in a large professional eventing program. She just arrived last week and her phone call to me was prompted by her having a moment of fear that she was in over her head. Being a competitor takes an element of showmanship. As a young person I was raised, both in my home life and in the school that I attended, that people should be judged by the quality of their character. It was a shock to me as I stepped into adult life that many people judge others by what someone can do for them, or even more so by who is best at being the center of attention. As I observed this I came to realize that I was fine being myself and that being the loudest person in the room had it’s benefits, but it didn’t necessarily mean that you were the smartest person in the room. Coming to Ocala as a horse person is something like being an actress arriving in Hollywood for the first time. Especially if you don’t know anyone, it is easy to feel overwhelmed. You suddenly become a small fish in a big pond. In one of his many brilliant YouTube discussions about leadership, Simon Sinek speaks about social hierarchy and alfas. He explains that humans are social animals, and we thrive on the recognition of others, and that the system of alfas was developed to keep the group as a whole safe. He also notes, however, that alfas are dependent on context. Someone who may be an alfa in one situation may not be the alfa in a different situation. There is no set standard by which we judge our alfas. If you meet someone and you feel nervous around them, they are the alfa. If you meet someone and you realize that they feel nervous around you, you are the alfa. My advice to anyone who is a student this winter is to be hardworking and humble, but to also develop and value your own strengths. No matter how independent you are, learn how to be a team player. If you are only a team player, learn how to be independent. Be prepared to unravel at the edges a little bit in order to progress to a higher level. Be open to observing the strengths and systems of your teachers, and apply everything that you can to your own system. Be inspired by the prowess of top horses and horsemen and use your talents to build lasting connections. It doesn’t matter if you wind up being a top Young Rider, an Olympic rider or an amateur, this sport is a passion for all of us and we are all alfas in different areas of our lives. Remember that your own path is not going to be the path of the person next to you, and bring your own gifts and qualities to the table, for the good of the whole. Happy learning and happy competing! Welcome to winter season 2018! I was talking with one of my students the other day about her realizing that she may be sabotaging her own success and progress as a competitor because she has a tendency to feel more comfortable coming up from rock bottom than winning. She recently moved up to the highest level she has ever competed, and after completing her first event at the level, she then got eliminated at her second. She realized that she felt a sense of relief at being eliminated because she felt that she had nowhere to go but up, and she reflected that perhaps it was time to move out of that mindset! I think sometimes we do self-sabotage when we have big goals. We idealize them in our brains to the point that we start trying for the goal itself instead of trying to be the athlete who is capable of that goal. Quantum physics notes the concept of levels of energy or vibrations in our universe. Positive thoughts or motivations raise our own personal vibrations. Negative thoughts or motivations decrease our level of vibrations. We perform best when our vibrations are high. For myself, when I have been close to reaching a new threshold of athletic performance, I know that I have achieved my best results not when I have focused on the outcome, but rather when I have focused on performing at my personal best, or when I have focused on being grateful for my equine partner, my journey and the opportunity to compete. I see the struggle of having the right mindset wreak havoc in both my professional and amateur students, and in both my adults and younger students alike. In a human and linear fashion, we outline our goals, and we idolize our heroes, and then we focus on the outward trappings of what that means. One student will tell me, ‘I want to compete at training level this year.” Another will tell me, “I want to compete at the 1* level by 2019.” Another will say, “I want this horse to take me up the levels and be the last horse I ever buy.” or “I want this horse to go to Kentucky.” Goals and aspirations are positive outlines, but leave them as just that — outlines. Instead, to assimilate those aspirations more quickly, look at your heroes and try to focus on being the horseman that they are. The legendary basketball coach John Wooden stated it a different way. He said, “Do not let what you cannot do interfere with what you can do.” My advice to my student was to focus on what she knew she was already capable of, and to live in that mindset. All of us who are competing are already a hero to someone else, and therefore we are already winning! We will grow as athletes much more quickly if we acknowledge the athlete we already are. If we perceive ourselves as being a winner, we will innately begin to win more, and the concept of a rock bottom will disappear. “Everyone must learn to ride under pressure.” This is a statement made by legendary 20th century horseman George Morris. I was born a highly competitive individual, but I was not born a natural competitor. As a teenager I found my niche in three day eventing. I loved horses, I loved galloping cross country and jumping, and I loved that much of the time, to me at least, the sport was about achieving a personal best. 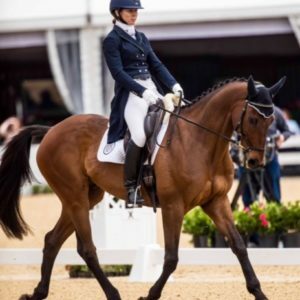 I always believed that if I was able to ride to the highest level of my own capability, that I would be a competitive rider, but for many years as I entered the ranks of professional riders, I struggled with disheartening expectations during competitions. The relationship that I had with horses was natural. I was drawn to them from a very young age, and I had an instinctive empathy for them. However, this instinct needed years and years of disciplined training before I began to feel any sort of mastery. As a junior competitor, I came up through the ranks of the United States Pony Club, achieving my ‘A’ rating while I was in high school. Pony Club taught me a structure. It taught me a breadth of horsemanship. It gave me a standard to strive for. Pony Club also taught me to fail, and failing was one of the most important lessons I ever learned. I was a capable kid. I was at the top of my classes in school. I played varsity sports. I was in the school plays. I was elected to student council and generally well-liked. In my circle of friends, I was a good rider. The first time I went for my ‘B’ rating, my first national rating, I failed the show jumping and grid-work section. I was fourteen and going into high school. My first instinct was to be angry at the raters and think that they didn’t know what they were talking about. My second instinct was to not want to go for another rating. They were grueling, and you had to be judged the whole time. I hated being judged. It was emotionally exhausting for me. After the testing, I put all of it out of my mind for several months as I started my freshman year of high school. Why did I need to be any better in Pony Club anyway? I was already starting to compete at the preliminary level in eventing on my own. Months went by. As Spring began to roll around, the option to pursue the rating again came onto my radar in the form of my mom bringing up. I always hated to walk away from a challenge. I asked myself if I believed I was a good enough rider to pass the rating. The answer was yes. Because of that answer, I realized that the failure, in fact, had been my own. It was hard to admit my own fallibility, but I realized that my seat and lower leg over jumps while riding without stirrups was not strong enough for the ‘B’ level the first time I took the test. When I owned this, I realized that it was up to me and only me to ride to the level that was expected, and it was nobody’s fault but my own if I didn’t pass. That summer I passed my ‘B’ rating. This failure gave me confidence. I learned how to separate emotion from level-headed assessment. Without this self-assessment, no real improvement could be made. I also learned that I had more. I had to dig deep to overcome my own pride at failing, but that pride was overshadowing my own ability. There have been many, many times in my life that I have failed at things. I have failed at competitions, I have failed at goals, I have failed in relationships. Life does not go on a smoothly charted course. Each time that I have faced a major failure, after the emotion has settled, I start with one simple question. “Ashley, do you have more?” The answer is always yes. That yes may not mean I attempt the same goal again, or even approach things in the same way. It simply means that I will have the confidence to learn, to grow, to be open, and to try to walk in the shoes of my best self. What I have learned is that often when we face challenges, if we start from a position of both humility and self-belief, if we start by walking in the shoes of our best self, the answer will eventually become simple. Often times it is easy to get wrapped up in the desire for a specific outcome, when perhaps the desire should be focused on producing the best product in the moment. 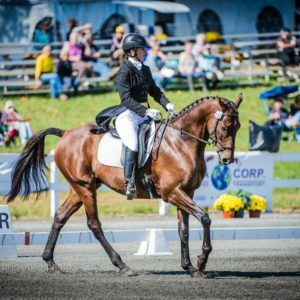 The other day, one of my adult amateur students asked me to write about confidence. She said that horses are big animals and sometimes she isn’t sure if she is doing the right thing. It is a valid point! I don’t remember feeling a lack of confidence in my aids as I was learning to ride, but I do remember struggling for years with my desire to be a good competitor. Even though I was riding at a very elite level, I would be so angry at myself for not reaching my personal competition goals. Then, one day as I was prepping for a major competition where I knew I needed to ride with confidence, I asked myself if I had more. The answer was yes. That ‘more’ was not that I rode better. It was that I decided to focus on being the best rider that I could in each moment of competition rather than focusing on the final outcome. I knew that if I rode to my personal best in each moment, that the outcome would take care of itself. Sometimes in life, all of the puzzle pieces seem to magically fall together in one wonderful moment or sequence of moments and amazing results occur. More often, however, we must polish our pearls. Pearls are created when a grain of rough sand becomes embedded in the interior mantle of an oyster, causing the oyster irritation. The oyster then deposits calcium carbonate in iridescent, concentric layers to smooth the rough edges of the grain of sand. Over time the pearl grows, with each layer creating more depth and luster, and making the end product more beautiful. I taught my first riding lesson when I was fourteen at a Pony Club clinic. To be able to move up to my next rating in the Pony Club system, I needed to know how to teach. 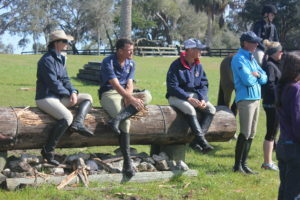 Richard Lamb, who is still active in the United States Pony Club (USPC) today, was the clinician. I was absolutely horrible. I don’t remember what I taught, but I do remember being nervous and having no idea what to say to the little girl I was supposed to help. I knew I was bad. In the weeks and months that followed my mom encouraged me, and the necessity of needing to learn to teach for the sake of my rating made me press on. By the time I was sixteen I was good enough that people began to pay me to teach beginner riding lessons. By the time I was seventeen, I had passed my “A” rating through Pony Club and was a certified instructor. Both of my parents are amazing, and I am incredibly grateful for their love and support. My dad has definitely taught me some big life lessons too. 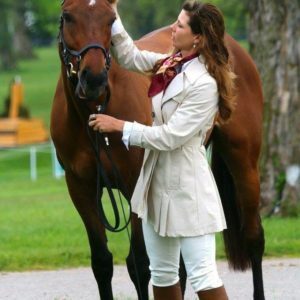 I would never have wound up as a professional horseback rider had it not been for my mother though, so I wanted to write this blog about some of the things I learned from her. Last weekend I got the opportunity to visit the beautiful Roebke’s Run Horse Trials in Area IV. There was a Town Hall meeting on Saturday night after cross country. One of the repeatedly voiced concerns was the sustainability of the sport from all perspectives. The equine industry is a tough industry. Horses are ‘the Sport of Kings’ As one of my friends says, ‘we will truly be financially successful when our barn managers can afford to buy a house from their salary.’ I am not to that point yet, but I do own my own farm, pay a monthly mortgage, and own two FEI (International Equestrian Federation) competitions horses that I pay to compete on my own dime. There is so much talk about prize money and sponsorship to help cover expenses in this sport. Frankly, that rubs me slightly the wrong way. The way that I see it, the business model at home needs to be working. I am certainly in favor of anyone who wants to be a part of my team, but I have never been one to feel that anyone else owes me something. I worked in the real world before the horse world which has helped shape the way I do business. Here are some of my thoughts.